Last week, we checked out this map of the music that's popular in your state (and only in your state), but, now that we know what music your state likes, what music does it hate? This map answers that question. The map is the work of Paul Lamere (who is responsible for creating the first map) and Randal Cooper. It uses data from The Echo Nest (a streaming service that powers services like Spotify, Pandora, and others) to compare the most popular music nationwide with their performance just inside statelines. 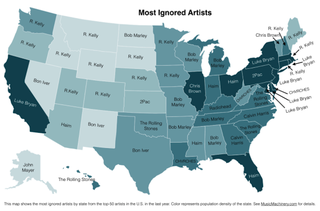 "R. Kelly is ranked the 42nd most popular artist in the U.S.," Lamere explains on his blog, "but in New Hampshire he's the 720th most popular, a drop of 678 positions on the chart making him the most ignored artist in New Hampshire." So, does the map fit with the music you hear (or don't hear) in your homestate? Tag the map and tell us what's going on in your locale. Image: Map via Paul Lamere.